The post Do-It-Yourself Speaker Project: SEAS A26 appeared first on Roderick van Domburg's Blog. My dad picked up a pair of Cabasse SAMPAN speakers in the 70s and so has literally played through them ever since I can remember. I just love the sound of them: warm and grand, sometimes bordering on bombastic, but ever so immersive. I have longed for a pair of big-sounding vintage speakers ever since. But what to do when a set of floor-standers would not meet the Wife Acceptance Factor? The SEAS A26 is a Do-It-Yourself kit for 28 liter monitors. The kit is a 21st century remake of the Dynaco A25, a legendary speaker in its time. More importantly, this set of largish monitors features an aperiodic port, that should make them sound larger than they are. This was exactly the fun Do-It-Yourself project that I was looking for. The front baffle calls for precision, so I had the baffles CNC’ed (computer-routed) by Kees of TechGraphix. An enormous audiophile himself, he even created his own CNC machine. Now that is DIY. The SEAS A26 plans do not specify how to attach the sides of the enclosure, so I mitered all edges 45 degrees for a seamless fit, as seen in Loudspeaker Magazine’s A26 build. My neighbor owns a high-quality table saw and was kind enough to help. I glued the sides with wood glue, held them with a corner band strap, and filled any holes with MDF filler. The cabinet is intended to remain closed, so I decided against drilling through holes to attach the drivers with nuts & bolts. Instead I pre-drilled 3 mm holes for use with 4 mm wood screws later on. Although SEAS touts the crossover as a first order crossover, it really just is a high pass filter to the T35C002 tweeter. The A26RE4 woofer has such a smooth roll-off that it the amplifier drives it directly. Here, less really is more, and I admire its simplicity. 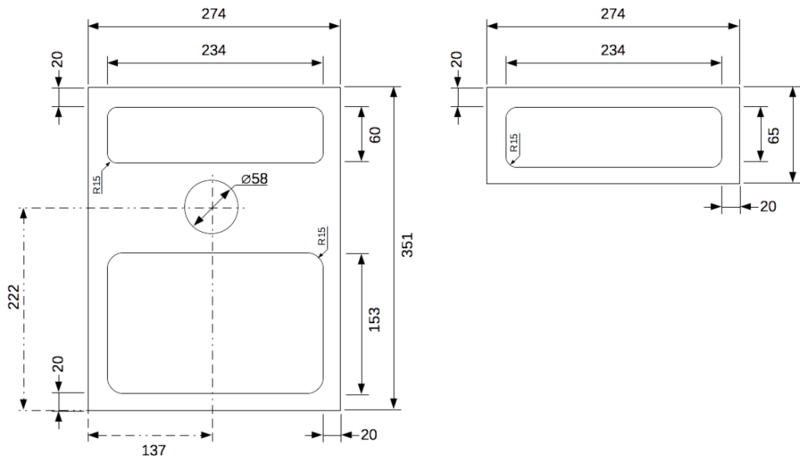 The main capacitor (C1) is a 3,3µF Mundorf MCap SUPREME (±2%, 600VDC). I also considered the Jantzen Audio Superior Z-Cap and Audyn Cap Tri-Reference. Of the three, the Mundorf is said to have that warmth that I am looking for, at a price point that is hard to beat. The bypass capacitor (C2) is a 0,01µF Vishay Roederstein MKP1837 (±1%, 160VDC) made of polypropylene film. 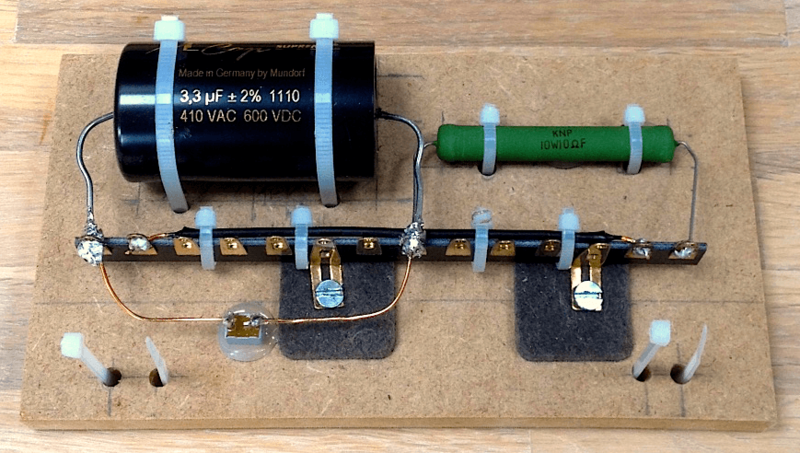 While not included in the original filter design, this is an inexpensive tweak to improve the transient response of the bigger main capacitor. The resistor (R1) is a 10Ω Jantzen Audio Superes (±1%, 10W). In spite of being wire-wound, it behaves like a metal oxide film resistor, but without the added grain. That means it should handle the fast transients well that are so typical of treble sounds. The competing Mundorf MResist SUPREME (±2%, 20W) is four times as expensive for a 10W higher power rating that is not all that necessary for a tweeter. I hot glued the resistor and two capacitors to a 12 mm MDF board, and tie-wrapped the main capacitor and resistor for extra strength. The open tie-wraps are for the internal speaker cables. They serve as strain relief for the solder joints. Much better! Gone is that first sweeping resonance. 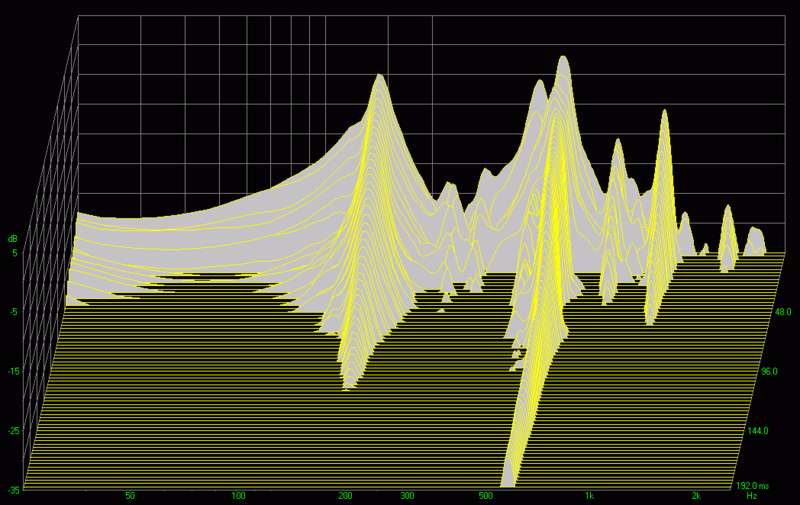 Others move up in frequency and are attenuated by as much as 14 dB. They extinguish faster too, except the one at 1200 Hz. 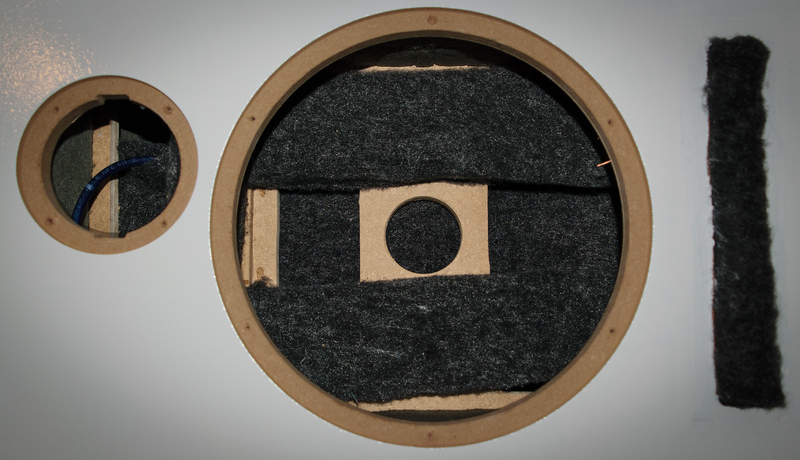 I settled on the bracing design of the World Designs A25 speaker kit, another remake of the Dynaco A25. That design supports the woofer’s magnet too, thereby improving its transient response. The bracing consists of a horizontal brace that intersects two vertical braces. Although the dimensions of the World Designs A25 differ from those of the SEAS A26, the construction plans to the bracing were easy enough to modify. 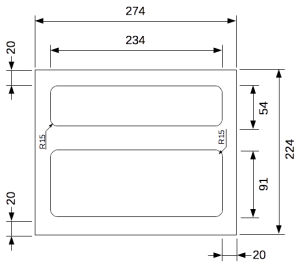 The following drawings are for 18 mm MDF. The plans to the SEAS A26 call for 19 mm, but that size is not readily available where I live. 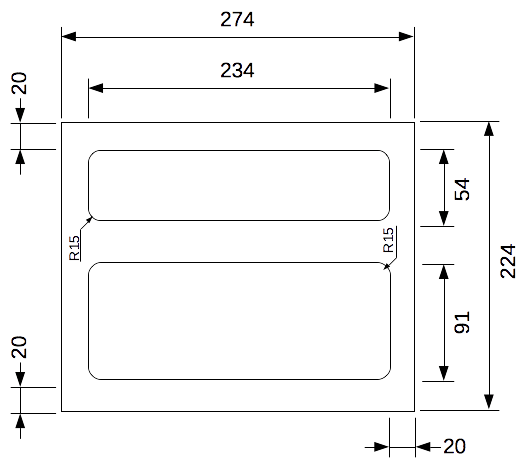 The diameter of the hole and corner radius allow for a few mm tolerance. I used a 57 mm hole saw, which still left a few mm for the “bump back” part of the magnet. The one critical dimension is the distance between the bottom vertical brace and the front baffle. This is 84,5 mm not accounting for any gaskets. I settled on 84,0 mm to account for my MONACOR MDM-5 foam sealing tape. It’s a good thing to line the interior with felt or wool. This is of course in addition to the polyfill damping that should be evenly distributed in the box. I’m not sure how much sonic difference the extra bracing does in this cabinet, but it’s good to stiffen the cabinet and support the magnet system. Awesome customer service. I really feel that Håvard went beyond the call of duty here. Much appreciated! Following Håvard’s advice, I decided to line the sides with DAMPING10 felt. Although DAMPING30 would damp better, I could not justify its price. It took real tinkering to get the protective sheet off of the self-adhesive layer. I thought that was pretty poor, especially considering the steep price for something made of recycled felt. To maximize the damping on the back, I mounted the filter board on two risers and fitted felt between them. The risers are simple pieces of 18 mm MDF glued together. The SEAS A26 plans for a terminal hole in the back, but who needs one when you can have binding posts? The gold-plated Jantzen Audio M6/27 binding posts are airtight without the plastic. Just drill two 6,5 mm holes, 19 mm apart, and tap the bindings posts into place. The cables are Jantzen Audio twisted solid-core 6N cables, 6N meaning “six nines” or 99,9999% oxygen-free copper. The isolation is thick, the cables sturdy, and their purity should guarantee a long life, free of oxidation. 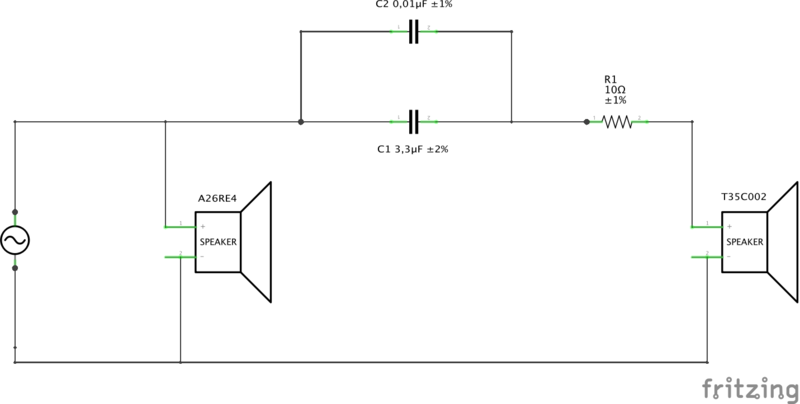 The thickness to the woofer is 1 mm² (17 AWG), to the filter and tweeter 0,5 mm² (20 AWG). That may sound small, but mind you: these cables are solid core, not stranded, so the actual amount of copper is relatively larger. 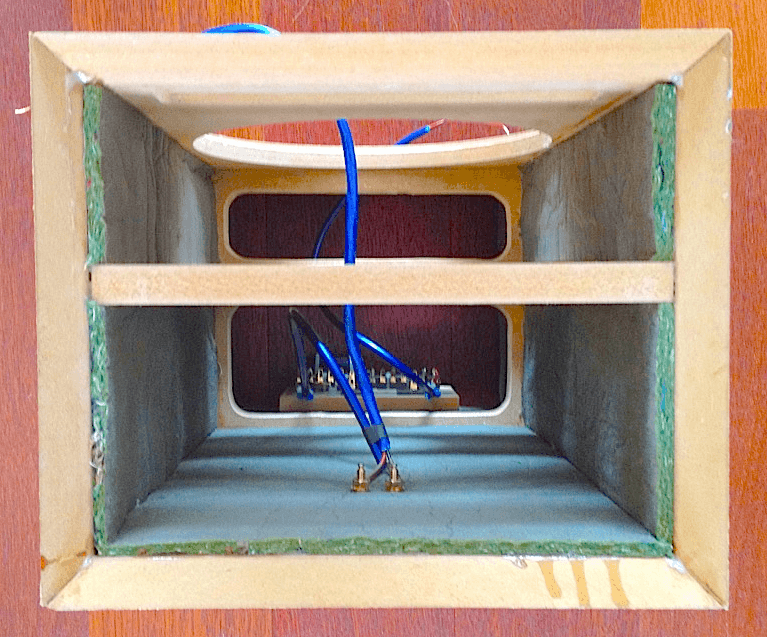 Finally, I used Intertechnik BS05G gold-plated banana plugs to connect the external speaker wire to the binding posts. I used black Sonofil as polyfill stuffing, 50 grams on the inside and 12 grams in the aperiodic port. Contrary to what is written in Loudspeaker Magazine, Sonofil sheets weigh 50 grams, not 62, so you need two bags. As for the aperiodic port damping, I did not fancy the looks of some sort of improvised grille. Instead, I cut a 23 cm piece of Sonofil to weight, rolled it up, and glued it in the port with transparent hobby glue. In the picture above, the bottom brace has stuffing attached on both sides. The back side is fully covered, the front has two strips from top to bottom. The top brace has a sheet on the back side, while the front stuffing is lying on the horizontal brace. I fixed all sheets in place with hobby glue. These speakers are intended for living room use, on a Meranti hard wooden floor with kids crawling and running about. 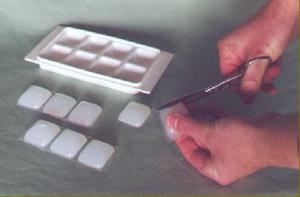 Not wanting to use spikes, I stumbled on a brilliant idea how to make silicone feet out of an ice cube tray. Though the instructions are in Dutch, the idea is simple enough to grasp, but hard to get right. First, putting the silicone layer on layer is sure to leave unsightly air cavities. Keeping the kit gun center prevents that, but may not fill the entire cube. Second, it can easily take two weeks for the cube to dry, and then some. I found that the bottom half would not dry without a hole in the bottom of the cube. I suggest that you drill holes beforehand. 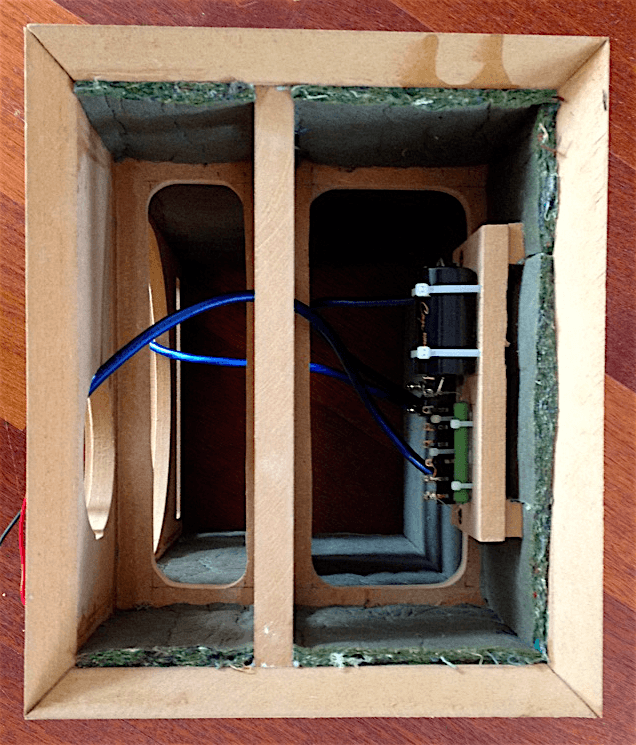 I have subjectively listened to the speakers in three configurations: first directly on the hard wooden floor, then separated by a sheet of DAMPING10 and finally with the silicone feet. I can attest to a noticeably tighter bass when using the feet. 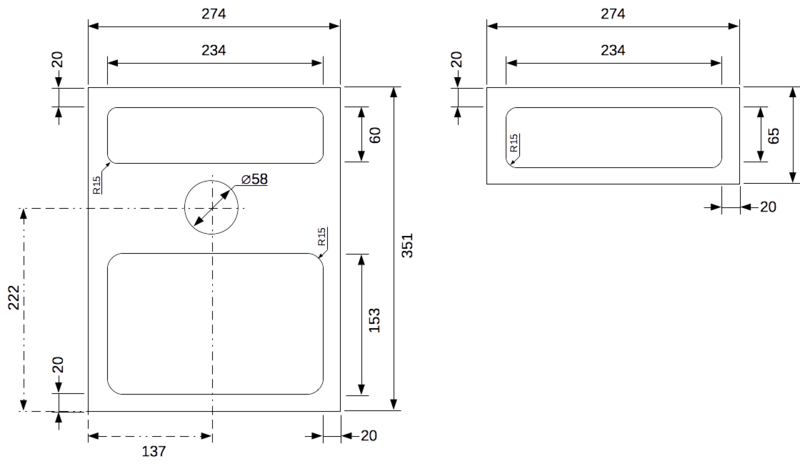 Loudspeaker Magazine posted the measurement diagrams with their review of their A26 build. Given that I have used bracing, damping and higher quality filter components, my build should sound even better. I turned and pitched the speakers so that they directly face the primary listening position on the sofa. Finally, I let the Mundorf capacitor break in for an hour or ten. I had not expected that to be necessary, but it was. Though the speakers sounded great on first listen, their midrange seemed to have collapsed the day after. Playing a variety of material opened them up again. There is a great sense of musicality to these speakers. Treble is extended, with great clarity and air. I literally rediscovered some recordings that I thought I knew. Cymbals, snares and all sorts of other percussion sound snappy and precise. The T35C002 is the première driver on the A26, and it shows. The bass response of the woofer is as good as my Klipsch Sub 8 was, and sits in well with the rest of the music. It is tight, deep and much more well-behaved and rounded than the Sub 8. Playing guitar virtuoso Steve Vai’s bellowing Warm Regards shows off the deep, round bass that this woofer is capable of. The soundstage is much wider than the speakers are apart physically. This really shows in a good drum stereo mix, such as the opening to the 30-minute Stranger In Your Soul epic by progressive rock supergroup Transatlantic. The height is fairly level, as expected of monitors. These speakers have a sweet spot for blues, country and jazz. Candy Dulfer’s saxophone sounds sweet and soothing. Eric Clapton’s “Chronicles”, B.B. King’s “Deuces Wild” and Willie Nelson’s “Milk Cow Blues” sound full and captivating. That is another characteristic of these speakers: a complete lack of listening fatigue. The A26’s do need high quality recordings. The “Three Tenors in Concert” recording, capturing Carreras, Domingo and Pavarotti iconic open air opera performance in Rome, sounds distant and thin, as if it was captured by a mobile phone in the audience. 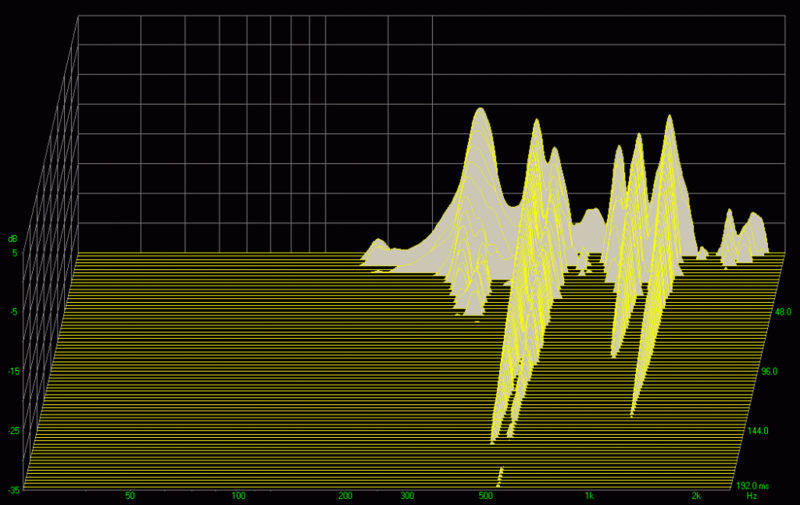 This is not the fault of the A26’s, but a unforgivingly precise reproduction of a mediocre recording. 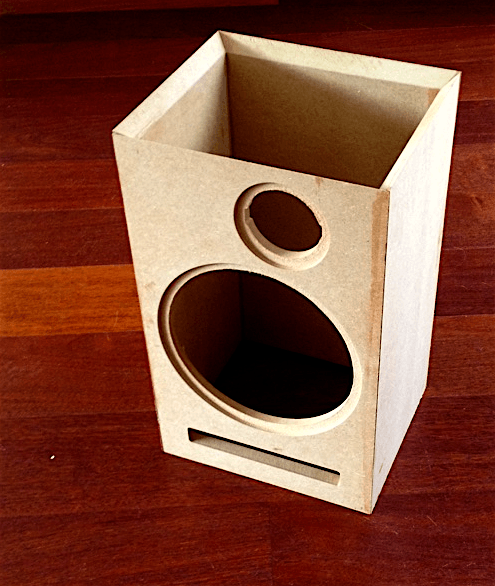 This speaker project turned out as a great success. The A26’s sure are the best speakers that I have ever owned. Compared to my dad’s SAMPAN’s, they sound tighter and more accurate, though not as majestic. These are high-end monitors, musical and spacious, hi-fi every way you look at it. As definitive proof, even my wife admits to enjoy their musicality. And who would have thought: she even likes their looks without a grille. I dare say that I will never buy speakers again. DIY is here to stay! “No comment.” That default response not only fails to satisfy media and their audience, it also rejects an opportunity to send your own message. When I was in media training, I learned a simple ABC to do so much better: Answer, Bridge, Communicate. Learn how to turn crisis communication into an opportunity on my LinkedIn Pulse. The post The ABC in Crisis Communication appeared first on Roderick van Domburg's Blog. “No comment.” That default response not only fails to satisfy media and their audience, it also rejects an opportunity to send your own message. When I was in media training, I learned a simple ABC to do so much better: Answer, Bridge, Communicate. Learn how to turn crisis communication into an opportunity on my LinkedIn Pulse. The post IT Governance: A Layered Approach appeared first on Roderick van Domburg's Blog. IT governance is essential to successful IT management. Without an established and maintained IT strategy and policy, IT decision-making is subject to the best intentions of whoever assumes decision authority. In spite of best intentions, ungoverned IT decision-making may not—and usually does not—fully align with overall business strategy and goals. The opposite is also true. Indeed, companies that do practice IT governance tend to outperform their competitors. Two well-known IT governance frameworks are COBIT and ITIL. The same institution that brought you the PRINCE2 project management method also owns ITIL. It prescribes best practices on how to manage IT services. COBIT does not limit itself to services and focuses on what to govern. Some suggest that they would pick COBIT over ITIL hands-down. One such proponent is a prominent IT consultant that goes by the alias of “The IT Skeptic”. I recommend his post on COBIT vs. ITIL, along many other excellent articles on his blog. However, I hesitate to put the one over the other because they are fit for different purposes. I believe that COBIT is better suited to overall IT governance, establishing what processes and structures should exist to align IT with business strategy. ITIL can then complement COBIT by answering how to do it. There are COBIT processes that ITIL does not cover. After all, IT infrastructure is only one piece of the puzzle. Application management captures the development and maintenance of applications. Functional management captures the demand function, sometimes called the user organization. Two frameworks that address these IT functions are ASL and BiSL. They specifically intend to tread where ITIL does not. While all frameworks actively seek alignment, there are some unsettled differences in terminology. With no fewer than four frameworks there is a real risk of drowning in bureaucracy. But remember that frameworks can not cause bureaucracy; only their implementations can. Take care to tailor IT governance to the size, risk, maturity, industry and environment of the organization. In all, the choice is not between COBIT and ITIL. Using a layered approach, COBIT lays down a foundation for ITIL, ASL and BiSL to build on. Great organizations practice IT governance—how do you?